Here on this page are some pictures from the Diamond Head Hike for a bit of what you can expect on one of the most popular hiking trails on Oahu with the best views. Since this is a crater hike in which your destination is the summit, this means one way is pretty much all uphill, and the other way is pretty much all downhill! The distance is a little less than 2 miles, and you can likely comfortably hike this trail in 1.5 hours. This is even if you take your time on the way up and enjoy the views at the summit. 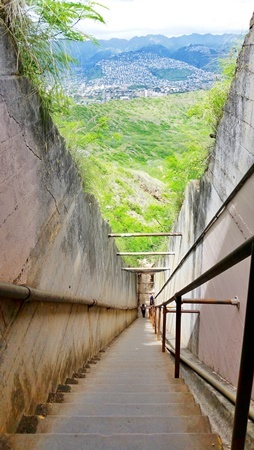 Diamond Head is a state monument with military history. This makes it a part of the Hawaii state parks system. 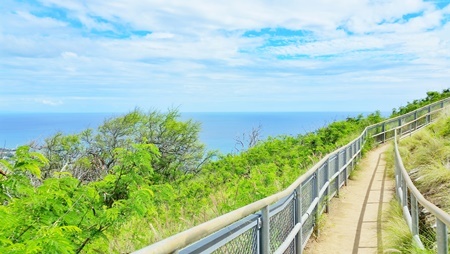 This hike is pretty near Waikiki and Honolulu, and it’s easy to get to Diamond Head by bus too. If you don’t mind a little extra exercise, you can walk to Diamond Head too… or even bike to Diamond Head! It’s $1 per person for pedestrians entering the park, and it’s $5 total for a car and all passengers. There is a parking lot at the base of Diamond Head crater. Usually parking isn’t much of a problem. But in the case that the parking lot does become full, parking at Diamond Head is different from the infamous parking at Hanauma Bay when you go snorkeling. At Hanauma Bay, you will get turned away if there’s a full parking lot. At Diamond Head, you’ll be able to wait until a spot opens up. Pictures from the Diamond Head Hike! Some of the best views of the ocean and mountains! And you’re in the Diamond Head crater! 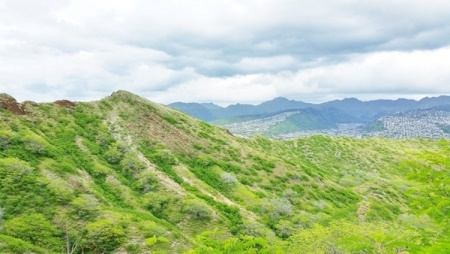 The Koko Head Hike is another hiking trail on Oahu with some of the best views to consider, and snorkeling at Hanauma Bay is also an Oahu activity to consider! The view of Waikiki and Honolulu from above at the Diamond Head trail summit! Tips for hiking Diamond Head: What to bring for the Diamond Head Hike! Consider wearing hiking sandals like these over flip flops. They will provide you with much needed better traction! And they are more breathable than shoes, and also probably have better traction than your current gym shoes. 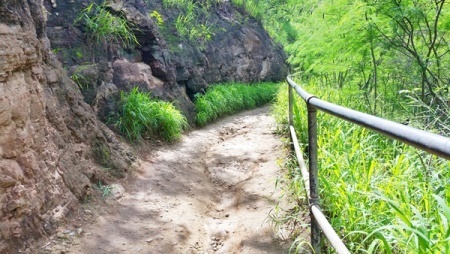 Many hiking trails on Oahu have dry and loose gravel, and this includes Diamond Head. This can make you prone to slipping if you’re not wearing proper footwear. WATER! You will be sweating on this hike! It’s a mostly open trail with minimal shade. It’ll be hot and it’s important to stay safe. These water bottles are popular in Hawaii. SNACKS! Even if you think you will be fine without food, just take an energy bar or two with you! It is amazing the difference a few hundred calories can make when your energy is drained. You may also consider picking up some dried pineapple fruit snacks or macadamia nuts from one of the many ABC convenience stores in Waikiki. Although the good thing about Diamond Head is that there is a food truck in the parking lot! But still, better to come prepared! Small backpack! It could be helpful to have a small backpack to carry things on your hike. Here are some affordable daypacks. Taking the bus: You can take a single bus ride to get to Diamond Head from Waikiki. The bus ride itself is about 10 minutes, but you’ll want to factor in time waiting for the bus too, both ways. The bus will drop you just outside the crater, so there’s about a 10 minute walk to get to the start of the trail. 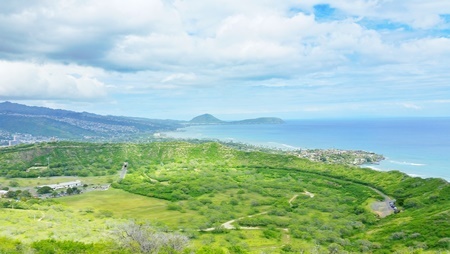 Here are more tips for taking the bus to Diamond Head. 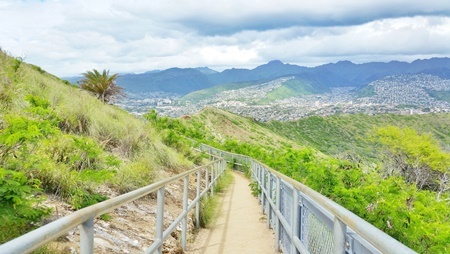 Walking: Get in a little bit of urban hiking by making the trek from Waikiki! One way is about 2-2.5 miles. You can always walk one way, and then take the bus back the other! Here are walking directions from Waikiki. 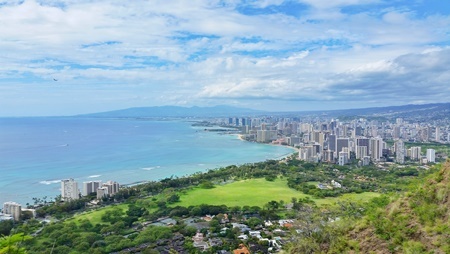 Driving: You may not really want to rent a car just for the Diamond Head Hike, but if you happen to be renting a car for other reasons too, Diamond Head is a quick drive from Waikiki. Here are driving directions. Biking 😉 If you’re up for making it a full-fledged adventure-filled day, consider biking to and from Diamond Head! 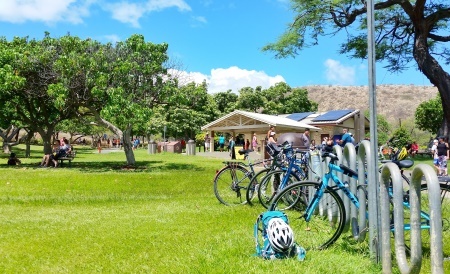 Here are tips for biking to Diamond Head. Consider making your biking route the scenic one by taking a similar route as biking to Hanauma Bay. This basically means going around Diamond Head Crater!